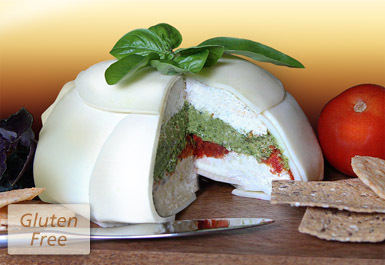 Caruso's Gourmet Foods is a specialty food company which has created the Italian Cheese Torta and provides a wide variety of gourmet recipes for all occasions using the Torta. Caruso's Italian Cheese Torta is the perfect dish for any party or gathering. Browse our website to learn more about Caruso's. Using innovative family recipes, Caruso’s Gourmet Foods provides creative appetizer and specialty dishes using its signature Italian Cheese Torta. The torta is more than an ordinary cheese ball – its the unique, secret ingredient for a variety of delicious recipes. Try a delicious Caruso’s Italian Cheese Torta today! Quick and easy to make dishes using the Italian Cheese Torta / Select an image to view its recipe. Sample the torta at a local event near you. Caruso’s Gourmet Foods • Cincinnati, OH • 513-226-5612 • www.carusosgourmetfoods.com • © 2012 Caruso’s Gourmet Foods, All rights reserved. LS3-Solutions.com - affordable custom web solutions.